This simple classic salon wall mount station will be a great addition to any salon. This station gives the stylist plenty of space for necessary tools and products. The laminate surface make the maintenance hassle free. Great ready for a great start! Station Dimensions: Length 14.5" x Width 36" x Height 8"
Drawer Dimensions (measured from inside): - Length 18" x Width 12" x Height 3.5"
Diameter of Appliance Holders: 2 smaller ones: 2" x 1 Large: 3"
Modern Design: This simple classic salon wall mount station will be a great addition to any salon. Easy To Clean: Made of MDF material for last long using. Laminated surface for easy care and clean up. Professional Salon Wall Mounted Shelf Station: Built in 3 appliance holders (two for curling iron/flat iron and one for a hair dryer) for daily use. 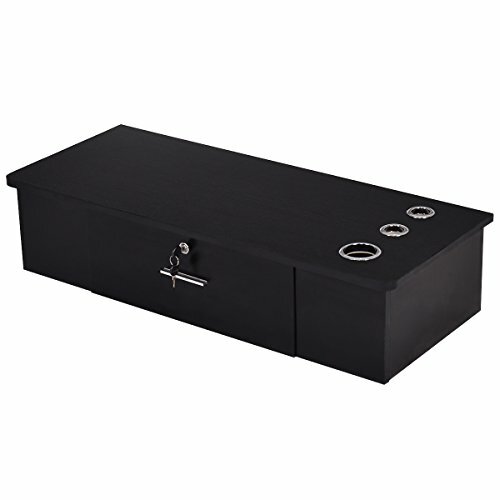 Locked Drawer Design: Spacious locking drawer with two keys included for storage the nacessary things. Easy To Install: Includes mounting brackets for easy installation. Great ready for Salon Use.